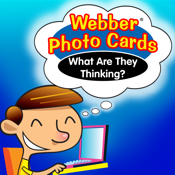 This App is simple to use - each student looks at an illustration and answers the question, "What are they thinking?" The student then gives a verbal response. After each answer, tap the green (correct) or red (incorrect) button to score the student's verbal response. Move to the next card by sliding the card currently on the display screen to the side, and the next image appears. Move to the next player by sliding the bar at the top of the screen. When you finish, view the results and email them to as many addresses as you like. • Track correct and incorrect responses for up to five players at a time.